Let’s all make a New Year’s Resolution together. Despite how hard we try sometimes, you can’t control everything in your life, even when driving you can really only affect in the way you drive. Vehicle-related deaths in the United States aren’t trending downward in any meaningful number over the last 10 years despite safety technology getting infinitely better. We’re a defensive driving provider, and it’s our job to educate people of the importance of the rules of the road, because when you’re driving in a 4,000lb object going 65 miles per hour, it’s a risky operation despite how normalized and engrained in our culture it is. Per the TDLR, In Texas during 2018 more individuals took a defensive driving class than in 2017, which likely means that more people were charged with traffic violations. So let’s set a resolution for 2019 to change one part of our driving habits that could one day save our lives. Let’s make a conscious effort to change a small part of our routine, and while it not be something huge that seems life-altering, slowing chipping away at bad habits leads to substantial positive change. So join us in doing one (or more) of these things to be just a slightly bit better version of you in 2019. Use a rideshare or taxi service more, even if it’s just a glass of wine or beer while you’re out for dinner. 31% of deaths while driving involve alcohol. Slow down just a little if you’re a speeder. 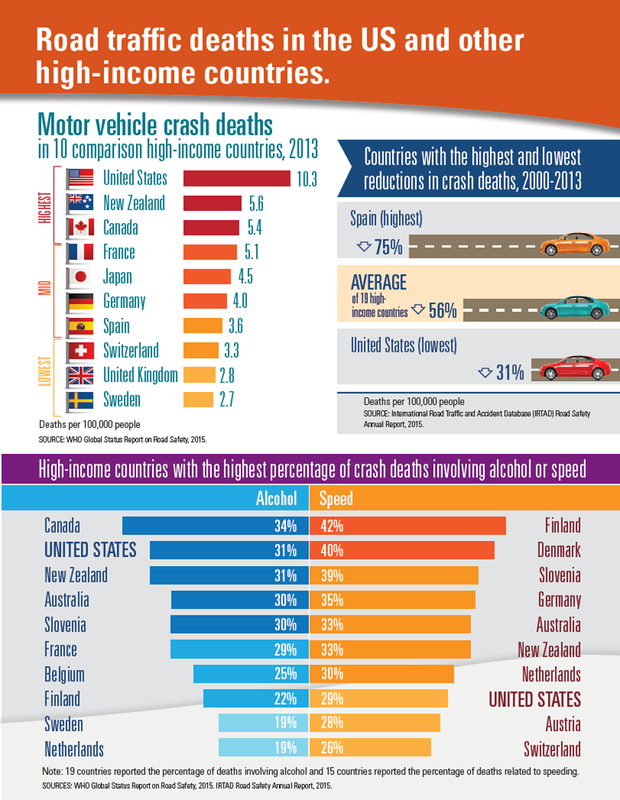 29% of deaths involve speeding. Wear a seatbelt at literally all times, especially if it’s just somewhere close. Of high-income countries we have a lower median front-seatbelt use (still below 90%!) even after all the information and PSA videos we’ve seen in our lifetimes. Buy a dashcam if you can. There’s options as low as $20, and they allow you to “go-to-the-tape” on anything that happens while on the road. On a personal note, I’ve found it makes me more self-aware while on the road. I don’t want to catch myself doing something I’d regret seeing played back on film. Take public transportation options more. While varying largely between cities, public transportation gets a bad reputation, especially among a younger demographic, but the rate of accidents are so much lower than private transportation that it’s worth utilizing as much as possible. Not to mention the benefit to the environment. Always use your indicators, even in the middle of the night and there’s no one around. Good habits translate to good driving all around. Think of how many times you’ve seen close calls on the road because someone is weaving in and out of traffic without a blinker. Never curse or yell at other drivers. People do things wrong, they make mistakes, or drive poorly; it’s perfectly natural for your response to bad driving to be anger. 3 deeps breaths could be the difference between a normal day and an incident. Listen, we know we’re just telling you some real basic things here. The golden rule, rules of the road, and similar, but these things make a difference. Changing small habits one at a time make an enormous difference over time. The reason we state the obvious is because the obvious needs to be re-stated. Much of being a defensive driver is learning some basic rules that you should know on the road. We’re not reinventing the wheel, we’re trying to make the roads a little bit safer one driver at a time. Maybe in 2019, just wear your seatbelt even if you’re just going to get the mail down the block. Slow down to where you’re not cruising at 15 over the speed limit. When someone cuts you off, let it go that time. We wish you all well in 2019, and safe travels.